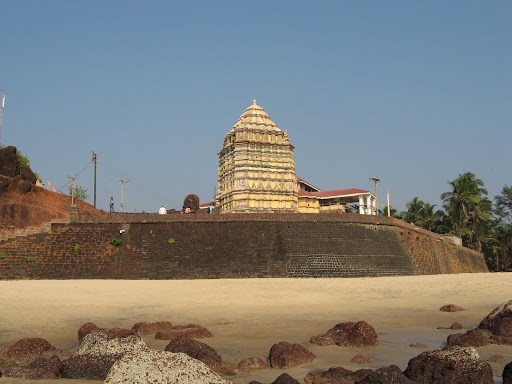 Kunakeshwar is a pilgrimage that is located beside the sea. It is situated in Devgad Taluka in the Sindhudurga district in the area of Maharashtra. It has a distance of 6 to 7 kms from the headquarters of Taluka. It is popular for both temples and beautiful scenarios. At Kunakeshwar there are many ancient temples that are said to be built by various sea-farmers who remain unknown till today. The temple has the deity of Shiva, also known as Ishwara. The temple has the facing in the east side and the presence of the Arabian Sea arise its serene view. The atmosphere here is calm and solemn. There is also a typical Konkani village under the same name where you can find plenty of coconut, betel nut and palm trees. Kankavliis is the nearby railway station which comes on the way to Konkan railway. Bus transport is also common in Devgad. Air service can also be available, but for that you need to board the flight from the Panaji airport which is situated in Goa. From there you again need to reach Kankavli by train. You must visit the place during the winter season which lies between October to March. The climate is cool and pleasant in this time.